“TCF stood with me like a mother. When I gave up, when I wavered, when I lost hope, TCF stood by me like a mother would for her child”. Meet Anum Fatima, a TCF Alumni whose journey began from a TCF classroom in her community to Harvard Summer School! Like many other students, Anum has faced great odds to pursue her dream of education. The TCF-USA chapter launched the APPNA Michigan Campus and along with it, the prospect of a better and brighter future for girls in Julkey Punjab. Education is changing the lives of girls like Nadia, allowing them an opportunity to build their lives and break free from the bounds of poverty and despair engraved within their families and communities. Meet Qurtualain, a dedicated Principal of the Dallas Ft.Worth Campus, in Matiari, Sindh. This school operates a morning and an afternoon shift, educating nearly 300 children. This video offers a sneak peak into the lives of these students, as improved by their access to education. From the streets into school, TCF is transforming the lives of countless children residing in the economically challenged district of Punjab-Bahawalpur, by providing them access to a quality education and an opportunity to build their lives. This is the Story of Yasmeen, a TCF Alumni and a mentor for the Aagahi Adult Literacy Program which provides illiterate women from rural areas and urban slums around TCF schools an opportunity to learn how to read and write Urdu and basic mathematics. 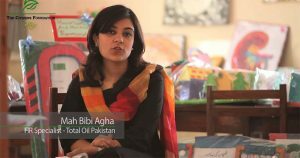 Hear about Mah Bibi Agha’s experiences as a volunteer for TCF Rahbar; A Mentorship Program aimed at the development of youth as responsible individuals and productive members of society.